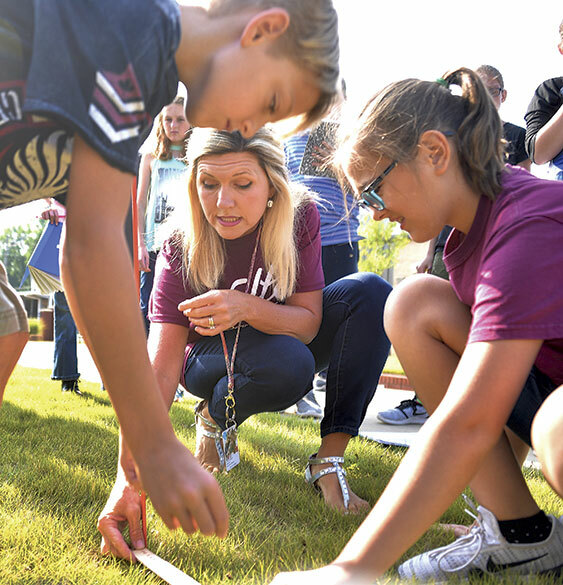 Hamilton Middle School fifth-grade science teacher Esther Ballard works with her students to build a sundial in the school’s courtyard on Aug. 24. Ballard is one of three teachers in the state to be nominated for the 2018 Presidential Award for Math and Science. HAMILTON - Hamilton Middle School fifth-grade science teacher Esther Ballard is one of three Alabama teachers to receive the 2018 Presidential Award for Excellence in Math and Science. With the award, Ballard is now automatically in the running to win the national award, which carries a cash-prize of $10,000 and a trip to Washington, D.C., to meet the president. In an interview with the Journal Record outside her classroom on a recent school day, Ballard said she is happy to have been nominated, but the students, not awards, are her main focus.